Before you use System Setup, it is recommended that you write down the System Setup screen information for future reference. CAUTION: Unless you are an expert computer user, do not change the settings for this program. Certain changes can make your computer work incorrectly. Turn on (or restart) your computer. When the DELL logo is displayed, you must watch for the F12 prompt to appear. Once the F12 prompt appears, press <F12> immediately. The Boot Menu appears. Use the up and down arrow keys to select System Setup and then press <Enter>. NOTE: The F12 prompt indicates that the keyboard has initialized. This prompt can appear very quickly, so you must watch for it to display, and then press <F12>. If you press <F12> before you are prompted, this keystroke will be lost. If you wait too long and the operating system logo appears, continue to wait until you see the Microsoft® Windows® desktop. Then, shut down your computer and try again. The System Setup screen displays current or changeable configuration information for your computer. Information on the screen is divided into two areas: the menu, and the main window. Options List  This field appears on the left side of the system setup window. The field is a scrollable list containing features that define the configuration of your computer, including installed hardware, power conservation, and security features. Option Field  This field contains information about each option. In this field you can view your current settings and make changes to your settings. Use the Tab and Up/Down arrow keys on your keyboard to navigate or click to navigate using the mouse. NOTE: Depending on your computer and installed devices, the items listed in this section may not appear, or may not appear exactly as listed. WARNING: eSATA is designed to function only if the SATA Operation mode in system Setup (BIOS) is set to either IRRT or AHCI. If it is set to ATA, the eSATA functionality is lost though the connector can still be used as a USB port. System information: Displays BIOS Info, System Info, and the Service Tag. Memory information: Displays Installed Memory, Usable Memory, Memory Speed, Memory Channel Mode, and Memory Technology. Processor information: Displays the Processor Type, Processor Speed, Processor Bus Speed, Processor L2 cache, Processor ID. PCI information: Displays available slots on the system board. Displays the system date and time. Changes to the system date and time take effect immediately. Specifies the order in which the computer attempts to find an operating system from the devices specified in this list. Enables or disables integrated drive errors to be reported during system startup. This option is disabled by default. 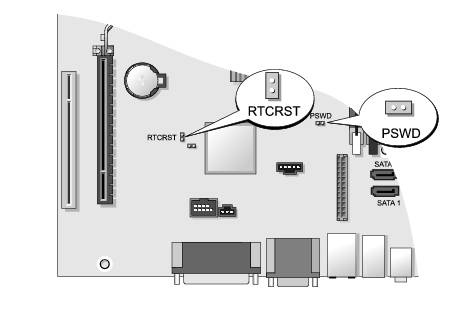 Enables or disables the SATA or ATA drives connected to the system board. Sets the base I/O address of the integrated parallel port. NOTE: Auto, the default setting, automatically configures a connector to a particular designation (COM1 or COM3). Specifies which video controller is primary when two video controllers are present on the computer. Specifies whether one or all the cores of the processor will be enabled. NOTE: The performance of some applications improve with additional cores. Enables or disables the Intel SpeedStep mode. Enables or disables the CPUID limit. Enables or disables the Virtual Machine Monitor (VMM) from utilizing the additional hardware capabilities provided by Intel Virtulization technology for direct I/O. Provides restricted access to the computer's system setup program in the same way that access to the system can be restricted with the System Password option. This option is not set by default. Displays the current status of the system's password security feature and allows a new system password to be assigned and verified. Enables or disables the user from changing the system password without the administrative password. This option is enabled by default. Enables or disables the trusted platform module (TPM) security. NOTE: When TPM Security is set to Clear the system setup program clears the user information stored in the TPM. Enables or disables the execute disable mode of the processor. Enables or disables the optional Computrace® service designed for asset management. Displays the current status of the password set for the hard drive connected to the SATA-0 connector on the system board. You can also set a new password. This option is not set by default. NOTE: The system setup program displays a password for each of the hard drives connected to your system board. Sets time to automatically turn on the computer. Time is kept in the standard 12-hour format (hours:minutes:seconds). Change the startup time by typing the values in the time and AM/PM fields. NOTE: This feature does not work if you turn off your computer using the switch on a power strip or surge protector or if Auto Power On is set to disabled. Enables or disables low power mode. NOTE: When low power mode is enabled, the integrated network card is disabled. Controls the speed of the system fan. NOTE: When enabled, the fan runs at full speed. Displays the Service Tag of your computer. Allows you to create a system asset tag if an asset tag is not already set. Controls the SERR Message mechanism. Some graphics cards require the SERR Message mechanism be disabled. Specifies how the ImageServer looksup the server address. NOTE: You must set the Integrated NIC to Enable with ImageServer to set the Lookup Method. Specifies the primary static IP address of the ImageServer with which the client software communicates. NOTE: You must set the Integrated NIC to Enable with ImageServer to set the ImageServer IP. Specifies the primary IP port of the image server with which the client software communicates. The default IP port is 06910. Specifies how the client obtains the IP address. Specifies the static IP address of the client. Specifies the subnet mask for the client. Specifies the gateway IP address for the client. Displays the current license status. When enabled (default), your computer starts more quickly because it skips certain configurations and tests. Enables or disables the NumLock feature when your computer starts. Allows you to specify the function keys to display on the screen when the computer starts. Enables or disables keyboard error reporting when the computer starts. This feature allows you to change the Boot Device Property for devices. Onboard USB Floppy Drive  The computer attempts to boot from the floppy drive. Onboard SATA Hard Drive  The computer attempts to boot from the hard drive. 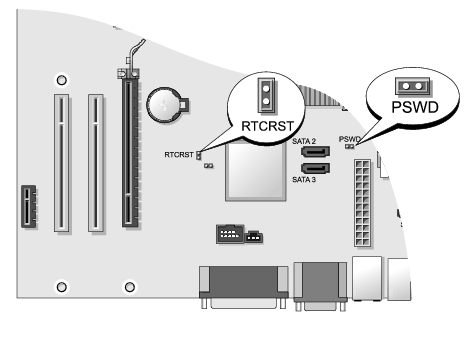 USB Device  The computer attempts to boot from a removable device, such as a USB key. CD/DVD  The computer attempts to boot from the disc drive. You can use this feature, for example, to restart your computer to a USB device, such as a floppy drive, memory key, or optical drive. If you are booting to a USB device, connect the USB device to a USB connector. When F12 = Boot Menu appears in the upper-right corner of the screen, press <F12>. If you wait too long and the operating system logo appears, continue to wait until you see the Microsoft Windows desktop, then shut down your computer and try again. The Boot Menu appears, listing all available boot devices. Use the arrow keys to select the appropriate device (for the current boot only). NOTE: To boot to a USB device, the device must be bootable. To ensure that a device is bootable, check the device documentation. Enter System Setup (see Entering System Setup). Click to expand SystemBoard and then click Boot Sequence. Highlight the appropriate device from the list of devices on the right and then click the up or down arrows to move the item you want to change. Click Apply to save the changes and then click Exit to exit System Setup and resume the boot process. NOTE: To boot to a USB device, the device must be bootable. To ensure that your device is bootable, check the device documentation. Insert the memory key into a USB port and restart the computer. The BIOS detects the device and adds the USB device option to the boot menu. From the boot menu, select the number that appears next to the USB device. The computer boots to the USB device. In system setup, set the Diskette Drive option to USB. Save and exit system setup. Connect the USB floppy drive, insert a bootable floppy, and re-boot the computer. CAUTION: Although passwords provide security for the data on your computer, they are not foolproof. If your data requires more security, it is your responsibility to obtain and use additional forms of protection, such as data encryption programs. CAUTION: If you leave your computer running and unattended without having a system password assigned, or if you leave your computer unlocked so that someone can disable the password by changing a jumper setting, anyone can access the data stored on your hard drive. Set  A system password is assigned. Disabled  The system password is disabled by a jumper setting on the system board. Not Set  No system password is assigned and the password jumper on the system board is in the enabled position (the default setting). To exit without assigning a system password, press <Esc> at any time (before you press the OK button in step 4). Select System Password, and verify that Password Status is set to Not Set. Type your new system password. You can use up to 32 characters. To erase a character when entering your password, press <Backspace>. The password is case sensitive. Certain key combinations are not valid. If you enter one of these invalid combinations, the speaker emits a beep. As you press each character key (or the spacebar for a blank space), a placeholder appears. Type your new password a second time to confirm and press OK button. The password setting changes to Set. When you start or restart your computer, the following prompt appears on the screen. Type the password and press <Enter>. If you have assigned an administrator password, the computer accepts your administrator password as an alternate system password. System halted! Must power down. Even after your computer is turned off and on, the previous message is displayed each time you type an incorrect or incomplete system password. NOTE: You can use Password Status in conjunction with System Password and Admin Password to further protect your computer from unauthorized changes. Go to Security® System Password and press <Enter>. When prompted, type the system password. Press <Enter> twice to clear the existing system password. The setting changes to Not Set. If Not Set is displayed, the system password is deleted. If Not Set is not displayed, press <Alt><b> to restart the computer, and then repeat steps 3 and 4. To assign a new password, follow the procedure in Assigning a System Password. Set  An administrator password is assigned. Disabled  The administrator password is disabled by a jumper setting on the system board. Not Set  No administrator password is assigned and the password jumper on the system board is in the enabled position (the default setting). The administrator password can be the same as the system password. NOTE: If the two passwords are different, the administrator password can be used as an alternate system password. However, the system password cannot be used in place of the administrator password. Enter system setup (see Entering System Setup) and verify that Admin Password is set to Not Set. Select Admin Password and press <Enter>. Type your new administrator password. Type your new password a second time to confirm and press OK button. The password setting changes to Set. A change to Admin Password becomes effective immediately (no need to restart the computer). When you enter system setup, the Admin Password option is highlighted, prompting you to type the password. If you do not type the correct password, the computer lets you view, but not modify, system setup options. NOTE: You can use Password Status in conjunction with Admin Password to protect the system password from unauthorized changes. To change an existing administrator password, you must know the administrator password. Type the administrator password at the prompt. Highlight Admin Password and press the left- or right-arrow key to delete the existing administrator password. The setting changes to Not Set. To assign a new administrator password, perform the steps in Assigning an Administrator Password. To reset system and/or administrator passwords, see Clearing Forgotten Passwords. Password features are enabled (default setting). The real-time clock has not been reset. The real-time clock is being reset (jumpered temporarily). CAUTION: This process erases both the system and administrator passwords. Locate the 2-pin password jumper (PSWD) on the system board, and remove the jumper to clear the password. See Password Protection. Connect your computer and monitor to electrical outlets, and turn them on. After the Microsoft® Windows® desktop appears on your computer, shut down your computer. Turn off the monitor and disconnect it from the electrical outlet. Disconnect the computer power cable from the electrical outlet, and press the power button to ground the system board. Locate the 2-pin password jumper on the system board and attach the jumper to reenable the password feature. Connect your computer and devices to electrical outlets, and turn them on. NOTE: This procedure enables the password feature. When you enter system setup (see Entering System Setup), both system and administrator password options appear as Not Setmeaning that the password feature is enabled but no password is assigned. Assign a new system and/or administrator password. 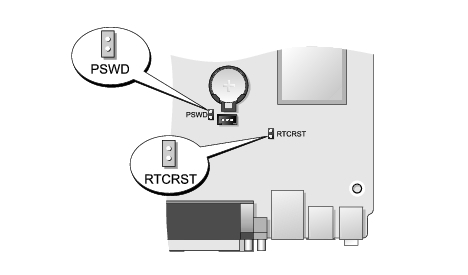 Locate the password (PSWD) and CMOS (RTCRST) jumpers on the system board (see Password Protection). Remove the password jumper plug from its pins. Place the password jumper plug on the RTCRST pins and wait approximately 5 seconds. 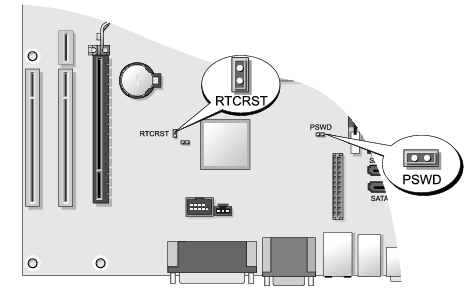 Remove the jumper plug from the RTCRST pins and place it back on the password pins. During boot, press <F2> to open System Setup. Select ImageSever from the list of boot options. Set Client DHCP to Static IP. Select Accept in the window that opens asking you to confirm changing the Client DHCP option. Set the Client IP with your desired IP address. The default is 255.255.255.255. Set the Client Subnet Mask to the address assigned to the client. The default address is 255.255.255.255. Set the Client Gateway to the gateway address assigned to the client. The default address is 255.255.255.255. Change the Lookup Method to Static IP. Set the ImageServer IP with the primary Provisioning Server IP address. The default address is 255.255.255.255. Save the settings and reboot the system.